"Jesus Falls the Second Time (Station of the Cross #7)." Click here to see this painting SPIN! See this painting in Houston Texas @ Xnihilo Gallery! In November of 2008 I was asked to participate in Houston's Xnihilo Art Gallery's "Stations of the Cross Exhibit" as station #7. For those of you that are unfamiliar with this church tradition, the Stations of the Cross are used during the season of Lent as a way to meditate and think about what Jesus did for us as he willingly died on the cross to pay the price for our sins. The stations begin with Jesus being condemned to die by the Romans and end with Jesus rising from the dead. The show will be on view throughout Lent (Feb 25 - April 25, 2009), which is the 6 and a half week period before Easter when Jesus resurrection from the dead is remembered and celebrated. Many Christians use Lent as a time to fast, pray, and willingly make sacrifices in their lives to help deepen their understanding of and relationship with God. In making Station #7, I really had no idea where to begin. However, after reading the scriptures used for this station and praying for direction, this is what I came up with. 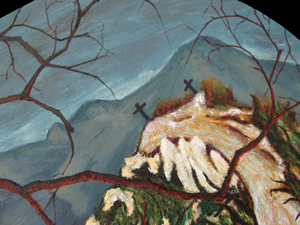 I knew that I did not want to do the obvious figurative depiction of Jesus falling the second time so I decided that instead, I would cast the viewer into Jesus "shoes" as he peered down the rocky road to Golgotha. However, in addition, I was thinking about how this painting is going to function as an aide to someone worshipping God. So I thought that I should add an interactive element to it. So I decided that the painting should rotate. Thus, my intent is that the viewer actually feels like he or she is falling as he or she views it. In choosing the subject matter included in the painting, I chose an olive tree because of it's Biblical connotations as a symbol for life and peace. I made it red because it is only through the blood of Jesus Christ that we are given true peace and life. 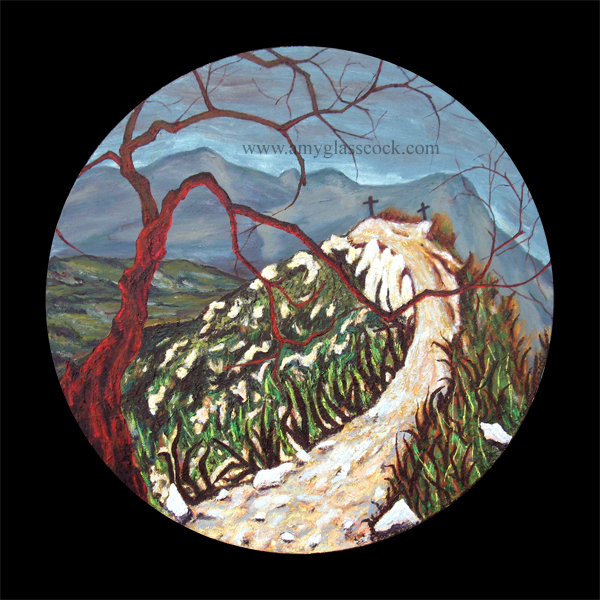 I also chose a rocky/pebbly road because one of the most vivid images that has stayed with me from the movie "Passion of the Christ" is the scene where Jesus falls on the rocky road with all of his bloody open wounds pressing against the stones. I can only imagine a fraction of the pain that he must have felt in that moment. Which, to me is the essence of the thoughts that this station is meant to have us meditate about.